The guitar George Harrison played at The Beatles’ last ever performance at Liverpool’s iconic Cavern Club has sold for £347,000 at auction. 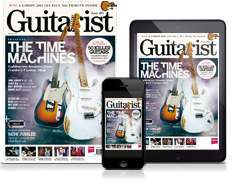 At the 13 September Gardiner Houlgate event, the guitar was sold to an overseas private collector by phone. The Mastersound MS-500, built by Australian brand Maton, was played by Harrison in summer 1963 while his Gretsch Country Gentleman was being repaired, including at the final, 3 August Cavern Club gig. When the Maton was returned, the guitar was purchased by Dave Berry And The Cruisers guitarist Roy Barber, who went on to auction the guitar at Sotheby’s in 2002, before it was exhibited at The Beatles Story museum in Liverpool from 2014 to 2018. It was last auctioned in New York in 2015 for $485,000, and was expected to reach between £300,000 and £400,000 ($400,000 and $500,000) this time around. Over 400 guitars were sold at the Gardiner Houlgate auction, including Bee Gee Barry Gibb's rare custom-made 1968 Gibson EBS-1250 double-neck, for £8,680. 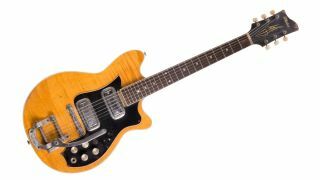 This isn’t the first Harrison guitar to go up for sale in recent years; The Beatle’s first electric guitar, a Hofner Club 40, was sold back in May this year, while his first ever guitar, a no-name nylon-string, sold last May.